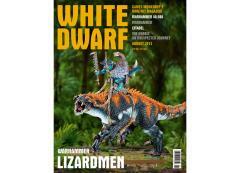 #404 "Lizardmen, Making Monsters, A Clash of Scale and Bone"
Jamie Farquhar's Iron Warriors in Army of the Month. The Lizardmen invade Nehekhara in this month's battle report. Duncan Rhodes explains why he loves his Bretonnians in Armchair General. They showcase a fantastic hive city board in Battleground. The designers of the new Lizardmen kits explain how they go about designing monsters. They showcase a beautiful gallery of Warhammer 40,000 squads and their transport vehicles. They show you how to paint both the Carnosaur and the Bastiladon in Paint Splatter.